Can you believe that Sunday is the first of October? Especially, since Summer decided to finally make a brief appearance this past week. Having Husky fur, I prefer the cooler weather. Also, Mom & Grandma leave the back door open so Moda & I can go in and out on our own. It's great but does take the fun out of pestering Mom & Grandma every time they are busy doing something. We have some great sales this week and into next week. This week through Saturday, October 7th. For our email subscribers, we are starting next week's sale tomorrow, Friday, September 29th. 35% OFF DISCONTINUED Northcott Stonehenge Fabrics. This includes Team Spirit,Sunshine Cottage, Earth Rhythms, Mojave, Mother Earth, Ginko. Mom has put all the Northcott Stonehenge fabrics on the top and middle shelves on the last 2 shelving units in the blender aisle. Grandma has the shelves are marked and the bolts of fabrics are marked with a dark red dot. Due to these deep discounts, a one yard minimum cut will be required. Hurry in! Once these fabrics are gone, they will be gone forever. There are 103 colors to choose from. We need to make room for our new blender line, Northcott Canvas, coming in 3 shipments starting in December. We think you will like this new blender collection and it's price point. With the rising costs of fabrics, we are trying to find some good quality fabric collections at a lower price. We will still be carrying Northcott's Tuscana Collection. This Fall, we have some new collections from Moda and Northcott coming in. 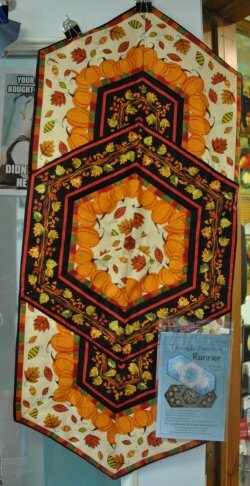 Moda's Autumn Abundance by Holly Taylor is gracing our little blue tea cart. To introduce this months' Show N Tell is Moda. Hi everyone! Moda here. Obi is letting me do the Show N Tell and update on the Hurricane Quilts! I'm soooo happy he's letting me do this. I can't hardly stop jumping for joy! All 3 of October's Show N Tell are done by my friend, Carolyn P. Carolyn was kind enough to allow us to display her projects for a little while. Isn't Carolyn's turkey adorable? She came up with this pattern on her own. It's made of homespun flannels, flannels and wool. She bought the homespun flannel and flannel at our Shop. The flannels and wool give it a nice soft texture that just radiates from it. 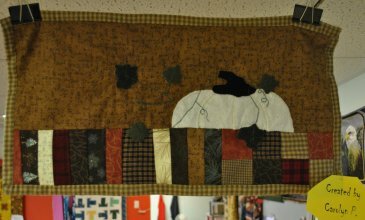 Carolyn found this pattern in Primitive Quilts. She wanted her pumpkin to be smaller than the one in the original pattern. She simply used the template at the size it was printed. 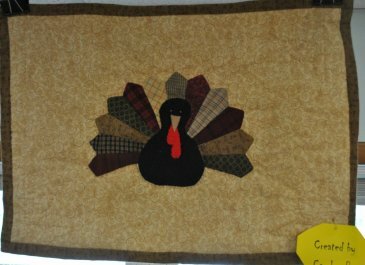 She used homespun flannels and flannel, most from our Shop. For the white pumpkin, she used fusible fleece instead of wool. I think Carolyn did a fabulous job for all of her projects. Onto our Hurricane Quilts update. The quilts have been coming in! We are so happy we are getting Hurricane Quilts in. 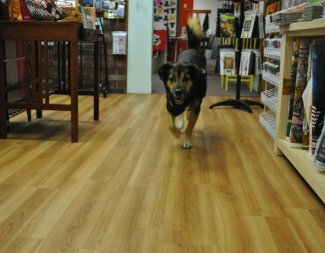 We are so very thankful for our generous and kind customers. A huge "THANK YOU!" to all of our quilts donating their time and fabric to make the Hurricane Quilts. We still have some Craft and Throw batting available. There is a $10 CASH deposit for each batting. 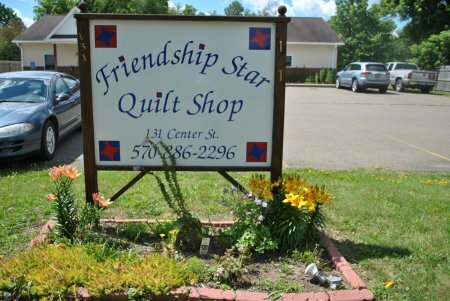 It will be refunded when you bring your finished quilt in. If a quilt is not returned the money will be used to buy Lowes or Walmart gift cards to send down to the hurricane survivors. Obi says I've done enough on my articles and not to overdue it. Thank you for reading my part of the newsletter. Mom said I had to let Moda write part of the newsletter. SURVIVE WITHOUT MY GRANDMA AROUND? runner. 12" 60 degree ruler and pattern required. Cooler weather is on it's way, quilting season is upon us. It's time to start those Halloween, Thanksgiving & Fall projects. 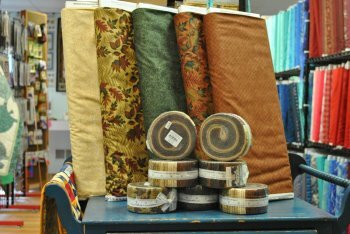 We hope you stop in to stock up on fabric, thread & notions. Moda and I get bored & whiny when we don't have customers to greet.